I know that all the time I have the opportunity to give thanks, but recently God has opened my eyes more and given me a very grateful heart. I have seen several tangible expressions of God's loving care for us in the past few months. One of the ways we have seen God's care is through bringing people to himself. I wrote in my last blog post about two new brothers in Jesus Christ. We are so thankful for the way God has been at work here in Buundo village through the ministry of Light of the World Church. Another way we have seen God's loving care for us is through your support. We wrote an email a few months ago about several significant expenses that we were anticipating, solar power for our house, water for our home and a tap for the community, and plane tickets for our upcoming furlough. When we received our monthly statements from December and January from Global Outreach we were so encouraged. God has graciously provided through many of you. Even though we do not write thank you notes as often as we should, we are so very grateful for many of you partnering with us in our ministry! 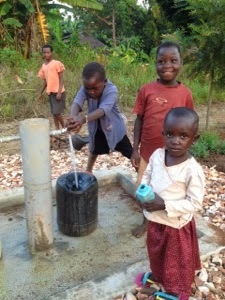 We have now been able to buy plane tickets, install the water and the tap, and install solar power for our new house. We praise God for your help! A third way I have seen God's loving provision is through good relationships with our new neighbors. Our new home is on the outer edge of GSF property and close to many homes in the village. Most of our neighbors do not yet trust in Jesus as their Saviour. But God has given us several opportunities to build relationships with them, and we are so grateful for this opportunity to share the gospel in relationship and in words as we learn the language. 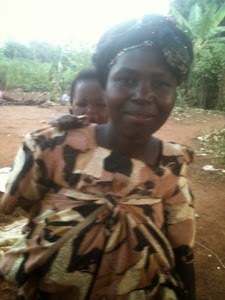 Below is a woman named Safina and her nephew, John. Speaking of our new house, we are thankful that it is nearly finished. Tomorrow we plan to have a thank you lunch for the workers and an open house and time of prayer for the GSF staff, missionaries and our neighbors. "Prone to wander, Lord I feel it, prone to leave the God I love. Here's my heart Lord, take and seal it, seal it for thy courts above." So whether it is easy to be grateful, like when I wrote the beginning of the post, or more challenging, like right now being awakened at early hours and not getting enough sleep, either way I can trust my Saviour that he is working for my good and rest and rejoice in his loving care. Well, even that faith is not something I can conjure up on my own; it is a gift from God. I am praying that God will help me continue to grow in faith. It is so easy for me to fall into a complaining spirit in my heart. Rather than thanking God for the amazing weather here most of the time, I complain in my heart about the heat and dust. Rather than trusting God's timing for all things, I complain in my heart when things are not finished on my timeline. Rather than remembering that God loved me so much that he sent his own Son to take the punishment I deserve in order to bring me into his family and give me eternal life, I forget his love and look to my circumstances or other people to make me happy. As I write this I realize how ridiculous my lack of faith is. In these early morning hours, I am praying that God will change my heart to make me more grateful for all of the ways he has shown his love to me. I am asking that he will give me a joyful, grateful heart today.